Both for pediatricians, and for families of children sick with diabetes emergence of complications of this disease is very important problem. As soon as the diagnosis of diabetes is established, parents often at own will go to library to gather any information on the matter and immediately appear before the fact of possibility of complications. After the period of experiences in this regard parents receive the following blow, having learned statistics of the incidence and mortality connected with diabetes. This information is, as a rule, obsolete and does not reflect modern achievements. It is the best of all to try to prevent such visit and to provide to parents at once the relevant general information. It is absolutely clear that exposure to complications depends on biological predisposition of some patients. (I sometimes use analogy to those smokers who, nevertheless, did not develop cancer). Unfortunately, we cannot define now what children treat this group. Prevalence of complications reflects the last achievements of medicine now, and the modern organization of a health service considerably improved, especially it concerns establishment of service of sisters on training of patients with a diabetes mellitus. Children and their families are provided now with information and the equipment for blood glucose monitoring so they are able to control a situation. Now it is already clear that good metabolic control reduces risk of development and progressing of vascular complications and now there are effective methods providing high-quality control at patients with diabetes. The purpose of work with the patient is conviction that the young man will successfully use all latest developments of diabetology for good metabolic control. Purposeful search of early clinical manifestations of complications is quite possible and therapeutic programs can be begun with great success. Pediatricians take these postulates very seriously. with complications at their patients. It was in conclusion said that at pediatric clinics there is "a spirit of optimism" which can influence moods of clinical physicians. Also authors assumed that adult doctors probably have more information on complications, than pediatricians. Thus, to pediatricians the challenge was thrown down to put the affairs in order. It especially was pertinent that diabetes at children arises at more and more early age, and as a result of it, it is possible that in clinics there will be about 40% of children at whom diabetes developed aged till 5 flyings. At a great number of patients diabetes will develop for 10 - 15 before they are defined in maintaining adult doctors. There is an opinion that years before puberty are not so important in the development plan for vascular complications as the period after puberty. Despite it, microvascular changes can be revealed several years prior to puberty, and some accompanying states (a necrobiosis and a cataract) can precede typical symptoms of a polyuria and a polydipsia. Main objective of treatment of diabetes is prevention of its complications. Until recently screenings on identification of complications and the accompanying states in pediatric clinics traditionally were not carried out. Now there are convincing data proving that carrying out screenings on identification of complications is reasonable and it is necessary. It is necessary to give these basic reasons and the principles of carrying out screening procedures. Complications of diabetes are serious morbid conditions (visual disturbances, a renal failure). It is necessary to study the nature of these complications. Screening procedure has to be acceptable for the patient. Identification of false positive and false-negative results is possible. The patient with the revealed disease has to be treated. It is necessary to provide to the patient the insurance policy according to which treatment will be carried out. In general the cost of diagnosis and treatment has to be opposed to rasyokhoda on primary medical care. Screening procedure has to be constantly continuing process, but not the one-time project. By the special ten years' researches DCCT it was established that groups in which the intensive insulin therapy is carried out have essential advantage before traditional groups as intensive treatment prevents a debut or slows down development of a retinopathy, a nephropathy and neuropathy in all patients with insulin-dependent diabetes irrespective of age, time of the beginning of a disease, initial glycated hemoglobin and a floor. There is a certain number of general provisions which deserve discussion. Though the research DCCT joined teenagers, the quantity them was small (14%), and children were younger than 13 years in general are excluded. Thus, only the teenagers, capable as it is considered to be, strictly to adhere to the appointed mode were captured. The mode defined as intensive included techniques of supervision and control (quadruple determination of level of glucose in days, weekly medical examination, purpose of insulin 3-4 times a day, definition of glycated hemoglobin each four weeks), and proceeded many years. Way of life (exercise stress, smoking). Points 3 and 4 are earlier factors, than sexual hormones / goryomon growth/IGFI, especially at development of microvascular complications. Microvascular diseases at a giperinsulinization. The high risk of a lipidemia - can be a consequence of inadequate control of glucose levels, or not have relation to diabetes and to be caused by other reasons (a diet, heredity). Prevalence of a retinopathy is higher it seldom occurs at the young faces receiving insulin, however till 12 flyings and for the first five years of a disease of premises for its development, as a rule, is not present. Prevalence of a retinopathy widely varies in various countries, but long researches showed that at diabetic children the retinopathy meets rather constant frequency. According to the last published research conducted in Finland it is established that retinopathy frequency at persons aged from 7,0 till 19,8 (on average, 14) and duration of a course of diabetes from 1,8 to 16,8 years (on average, 6,5) made 28%. It was proved that the frequency of developing of a retinopathy is in linear communication with duration of a course of diabetes and after 10 flyings of a disease the frequency of a retinopathy can reach the level of 80%. The Proliferative Retinopathy (PR) develops after puberty and leads to a blindness as a result of hemorrhages in a vitreous, fibrosis and peeling of a retina. PR is seldom observed in the first 10 years of a disease, but in 20 flyings (retrospective data) leads to a vision disorder. The developed symptomatology is always preceded by the eclipse period (the minimum changes which are not leading to a vision disorder which a long time can remain stable). Many researches confirmed communication between inadequate glycemic control and beginning / progressing of a retinopathy. Adequate glycemic control at any age is necessary and inspires optimism in respect of prevention of vascular complications. However, glycemic control during the different age periods (small children, the average childhood, teenagers) pursues also a little various aims: so, it is especially important to avoid hypoglycemic states at children 5 years are younger. To investigate prevalence of excretion of albumine in population of the children sick with diabetes and to find out whether it is a constant. To define character of a microalbuminuria at children. To find out a ratio role albumine/creatinine as both indicators can serve as sensitive and specific markers at children with a microalbuminuria. Though inadequate glycemic control is risk factor for development of a diabetic nephropathy, not all patients are subject to this risk: at some patients even at inadequate glycemic control of a serious nephropathy does not arise. It allows to assume existence of possible protective factors, or unknown of the factors which are still injuring kidneys which are involved in pathological process. So far it was succeeded to find out that a part is played by the following: age at which there is diabetes, the diabetes duration, a relative insulinorezistentnost, smoking and family predisposition to diabetes and hypertensia. Hypertensia, however, is a consequence rather, but not the reason of a nephropathy. at adults the microalbuminuria is defined as the albumine excretion speed (AES) within 30-300 mg / 24 hour (or 20-200 tsd / mines) according to two or triple researches within a day. It is rather difficult to make these repeated researches at children, but concentration of albumine in the first morning portion of urine rather closely correlates with SEA within all 24 hours. The approximate indicators defined in a morning portion can be specified, by urine creatinine definition in the same portion, to correct the speed of a renal blood-groove and to calculate coefficient albumine (mg/litre): creatinine (mmol/l) (AKK). It is shown that coefficient albumine/creatinine in morning urine closely (0,91) correlates with a night speed of excretion of albumine. When using indicators of AKK corresponding of 3,5 mg/mmol and SEA 30 tsd / mines their high specificity (90-95%) and sensitivity (88 - 100%) comes to light. Thus, the given researches can serve as a screening method of the choice. As it is told above, the situation at children is less clear. Karachalli and employees published the AKK levels of the children sick with diabetes and healthy. AKK value of healthy children was 0,47 (at 95% within 0,14-1,57), but at 12 of 129 children sick with diabetes, AKK exceeded 1,57 (9%). Other researchers gave the microalbuminurias from 7 to 20% given to prevalence. The repeating tests defining AKK showed that similar changes are changeable, but when the AKK levels are in limits of 1,5-3,5 mg/mmol, AKK should be controlled constantly if its values exceed 3,5 mg/mmol, these patients need specific therapy. DCCT showed progress of specific therapy in prevention of a nephropathy: the microalbuminuria developed 39% less often, and a nephropathy - for 54% in comparison with group of traditional treatment. When it becomes clear that children have a constant and considerable microalbuminuria, the best efforts have to be used improving glycemic control. It is shown that inhibitor of an angiotensin-converting enzyme (IAPF) captopril reduces albumine excretion at children. It is considered that IAPF are choice drugs, but sufficient clinical experience is not saved up now to recommend them for continuous use for children the increased AKK levels without microalbuminuria. Though restriction of protein is the successful and tested method of treatment of diseases of kidneys at adults, in pediatric practice this method is not used as can cause additional problems. Though disturbances of various functions of a nervous system (motor, touch, acoustical, visual, autonomous) at patients with diabetes of children are known long ago, they do not raise such questions as a nephropathy or a retinopathy. Frequency of a cordial rhythm changes at deep breath. At compression of hands diastolic pressure increases. At the children sick with diabetes, much higher cordial rhythm at rest, its insignificant variability is defined at deep breath, and less expressed reaction to a body postural change, than at healthy children. Results of tests 4 and 5 (change of arterial pressure) in both groups practically do not differ. Disturbances of a cardiovascular autonomous nervous system arise against longer course of diabetes and demand more strict control of a metabolism. They meet at the male children who reached puberty more often and are combined with peripheral neuropathy. At adult patients with diabetes of disturbance of autonomous function can lead to arrhythmias, a sudden cardiac death, and mortality in this group, in comparison with the general population of patients with diabetes, above. There is a number of the facts allowing to assume existence of communication between changes of arterial pressure and disturbance of autonomous function at children and teenagers. Not clearly, whether emergence of the phenomena of autonomous dysfunction can serve in early age as a predictor of emergence of late, more serious complications. Products and metabolism of polyols play an important role in development of many chronic complications of diabetes. Accumulation of osmotically active sorbitol in cells can cause their swelling that leads to frustration of a nervous trophicity and development of a cataract. However, the cataract is not frequent complication, and nevertheless, children can be observed some time at the ophthalmologist with complaints to decrease in sight until the diagnosis of diabetes is established. The cataract can arise within already first years of a disease and difficult gives in to therapy. At insufficient glycemic control at children skin infections are rather often observed, - both bacterial (staphylococcal), and fungal, and as a rule, they arise against bad care of legs (the grown nail, a paronychia, etc.). It is necessary to take urgent measures if family members are bacilli carriers of staphylococcus or the child is the carrier of a nasal or perineal infection that demands system purpose of sensitive antibiotics. There is a set of very specific options of damage of skin connected with diabetes. In our clinic during 15 flyings we observed a lipoid necrobiosis in 5 cases from 170 (from them four are girls). Prevalence of this disease among adult 0,3%. The main pathophysiological mechanisms of its development is to a povra> a derma collagen kdeniye with forming around inflammatory granulomas and ulcerations. Usually it demonstrates accession of consecutive infection and the positive effect gives use of antibiotics. Primary process hardly gives in to therapy. With various success try to apply steroids as it is system, and locally. When process ceases, hems can be disguised cosmetic with use of methods of plastic surgery. Restriction of mobility of joints. age from 10 to 20 years it is also connected more likely exactly with age, but not the duration of a course of diabetes. According to different data, prevalence variirut it from 9% to 31%, and scope of these figures testifies to difficulties in definition of this syndrome. In group of 357 people of OPS it was observed at 66 children (prevalence of 26%). All these children were more senior than 14 years, and duration of a course of diabetes at them exceeded 5 years. Existence of contractures closely correlated with data of glycemic control (concentration of NA1), diabetes duration, age at which diabetes, began average values of cholesterol, arterial pressure. According to other authors if at patients with diabetes for 16 flyings of an illness of OPS does not arise, it is followed by 25% risk of microvascular complications, at patients with OPS the risk increases up to 83%. Need of measurement of growth for children's diabetic clinic does not need justification. Growth rates and an increase reflect quality of glycemic control in the weight of the child. It is also important to document an insulin dosage on kilogram of body weight. 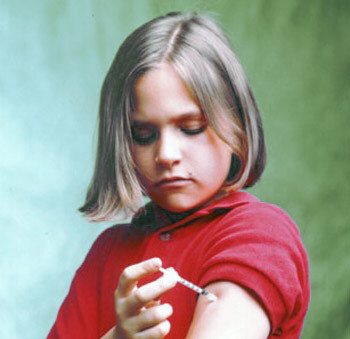 The need for insulin of children for the prepubertal period makes about 0,8 PIECES/kg; during puberty it raises, but should not exceed 1,5 PIECES/kg. Upon termination of puberty the dose needs to be lowered to former level, otherwise there is an undesirable increase in weight. It is important remember need of confidentiality at inspection of children, in particular, teenage girls can not to want to be weighed at strangers. At measurement of growth it is necessary to consider growth of parents, it is important to document the beginning of puberty also. Survey by a foot is rather important. Pathology a foot often occurs at children with diabetes and contributes to development in them of diabetic foot. The hyperhidrosis which against inadequate glycemic control can play a role in developing of a fungal infection is also described. Barnet and sotr. suggest to perform regular inspections as well footwear as incorrectly picked up footwear aggravates biomechanical disturbances. At children with OPS deformation of fingers standing is also observed. to estimate also the ABP of parents and blood relatives. It is considered that 24-hour monitoring of the ABP reflects communication between the ABP level and uric excretion of albumine more accurately, than single measurement in clinic. At a combination at the patient with diabetes of the child of a microalbuminuria and hypertensia purpose of APF inhibitors is reasonable, but this issue has to be resolved together with the children's nephrologist. In 5 and 10 years after establishment of the diagnosis, and at the children who are in the pubertal period - annually, it is necessary to measure coefficient microalbumine / creatinine in the first morning portion of urine. Children at whom this coefficient exceeds 3,5 mg/mmol have to be invited for determination of night levels of this coefficient. We register knee and akhill the reflexes as kept, lowered or which are absent. Research also joins determination of vibration and propritseptivny sensitivity. Vibration sensitivity is estimated on 0-8 mark scale of Ridel Sheyfer with use of a tuning fork. For detection of subclinical autonomous neuropathy at sick children and teenagers the polarized papillometriya (dark adaptation is estimated), which results correlate with duration of diabetes and glycemic control is carried out. Options of reaction of pupils, nevertheless, have no communication with results of research of cardiovascular system. Screening of autonomous dysfunction has to be implemented in practice of children's clinics. We perform inspection of an eyeground in the dark room at nedilyatirovanny pupils annually, and also photography of a retina in 5 and 10 years of a course of diabetes (at children in prepuberty). Regular surveys at the oculist, control of sight is desirable for all persons having diabetes. Levels of the general cholesterol and LVP are very stable for day and do not depend on meal, levels of triglycerides, on the contrary, increase after food. Dislipidemiya occurs at 39% of children with diabetes that it is more, than exceeds an indicator of control group (17%) twice. Some specialists suggest to consider as norm border for patients with diabetes of children lower indicators of cholesterol as its concentration increases with age (according to standards of WHO - 4,1 mmol/l). The LVP levels in two groups significantly did not differ though at high-quality glycemic control at patients with an insulin-dependent diabetes mellitus higher levels of these anti-atherogenous lipids come to light. Control of lipids has to be carried out in clinics as routine part of annual inspection. If the dislipidemiya is revealed, it is necessary to improve glycemic control, correction of a diet can be especially important. It is necessary to draw a conclusion that screenings in children's diabetic clinic lead to positive takes and help to reveal patients with risk of emergence of complications, in particular, of vascular. Screenings focus attention on improvement of quality of glycemic control, pathology of a lipidic profile, increase of arterial pressure, need of refusal of smoking, adequate care of feet that finally reduces risk of emergence of complications.